RPF Recruitment 2019 Notification is out. This time the notification is for the available 798 Constable, Cobbler Grade III, Tailor Grade III Vacancies. Therefore, all those interested people, who really want to get in a Railway job, can check all the Requirments. And then if they are interested and eligible, they can proceed to submit the application form before the final date. Apparently, the officials of the Railway Protection Force are going to accept the filled application forms in the prescribed format until 30th January 2019. Basically, after the closing date, no application will be considered. So, hurry up and use this bright chance, of getting placed. Remember as of the time of applying for the Railway Recruitment Force Recruitment 2019, candidates need to have all the Qualifications correctly. Here is the real-time chance for all the job searchers who are searching for the Central Government Jobs. Well, the officials of the Railway Recruitment Force are looking for the candidates, who completed their 10th or 12th From any Recognized Board or Institute. Remember it is very important for the candidates, to have all the Qualifications correctly. If not all such applications will be rejected along with those submitted after the final date. 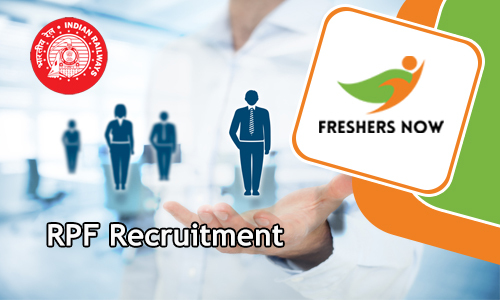 Now, in case, the candidates, not interested in this RPF Openings 2019, and want to check other Latest Government Job opportunities, then you can find them on our site Freshers Now. At the time of applying for the RPF Recruitment 2019, contenders need to finish their 10th, 12th from any Recognized Institute or University in India, as the Educational Qualification. Applicants age must lie between 18 years to 25 years. For Age Relaxation, you must refer to RPF Recruitment 2019 Advertisement. Candidates, have to clear the Written Test followed by the Personal interview. Rs.19,900 to Rs.63,200/- Per month is the salary the selected candidates, will get. First of all, go to the official site of the Railway Protection Force at indianrailways.gov.in. Hope you find all the information about the RPF Recruitment 2019 helpful. Railway Protection Force is very excited to release the RPF Recruitment 2018-2019. So, all the candidates who are looking for latest Railway Jobs can clutch the Upcoming Railway/ RPSF Constable, SI Posts. Moreover, many of the job hunters are anxiously looking for the RPF Recruitment 2018-2019. For those people, the Railway/ RPSF Constable, SI Posts are very helpful. So, all the contenders who are seeking for Central Government Jobs especially in Railway Department can take a look at the entire article very thoroughly and find the overall information. In addition, to this, we have forwarded a step forward and collected all the eligibility criteria. As we all know that without having minimum knowledge about the Education Qualification, Age Details, Selection Process, Pay Scale, Post Wise Vacancy Details, Application Fee and steps to apply for Railway Protection Force Jobs 2018-2019 it is very difficult to apply. Contenders are you interested in applying the RPF Recruitment 2018-2019? well, you have landed in the accurate place to check and apply for Upcoming Railway/ RPSF Constable, SI Posts. Moreover, before applying for the Railway/ RPSF Constable, SI Jobs 2018-2019, all the contenders must satisfy all the eligibility. So, it is mandatory to check the entire details. Therefore, for the sake of candidates, in this post, we have attached a overall information. To help the people, we have collected most precise information. Also, we got a news, that many of the eligible aspirants are unable to get the Submission of RPF Online Application Process. So, you can also find the Application Process details from the below section. Without a late focus on the complete article and grip the data. Moreover, you people need to apply for latest RPF Job Openings 2018-2019 in between starting and closing dates. Moreover, this is the right chance for the people those who had completed their 10th/ 12th and Graduation are only eligible to apply for RPF Recruitment 2018-2019. Moreover, many of youngsters are showcasing their interest in Police Jobs. For those people, the Upcoming Railway/ RPSF Constable, SI Posts is the golden chance. Many of the candidates had done their education and waiting to build up their career in the Railway Department at the same time Police Department. Therefore, in upcoming months the Railway Protection Force will release the RPF/ RPSF Recruitment 2018-2019 in upcoming months. So, before that, we have grabbed this valuable news and shared in this article. Therefore, to get the further details, follow the entire post very thoroughly and get the latest stuff. Good news for the candidates those who are looking for RPF Recruitment 2018-2019. because in this article, we have equipped all the information in a detailed manner. So, all the candidates those who have Minimum 18 Years and Maximum 32 Years can apply for RPF/ RPSF Recruitment 2018-2019 without late. In addition, to this, the Age Relaxation is also applicable as per the Government Rules and Regulations. So, we are suggesting the candidates that go through the Official RPF Recruitment 2018-2019 Notification to check the category wise age relaxation details. Also, coming to the Selection Process, all the participants need to face Written Exam, Medical Test, Physical Test, Personal Interview and Document Verification. So, to get a place in the Railway Protection Force, all aspirants must and should clear all these rounds. Everyone knows that to apply for RPF Constable (Female. Male) and SI Vacancies 2018-2019 need to pay some of the Application Fee. Moreover, the Railway Protection Force has given the separate application fee for all the categories. In addition, to this, to get the Upcoming Railway/ RPSF Constable, SI Application Fee just click on the below given Official Advertisement and find out the data. Also, you can receive an attractive pay band along with the Grade Pay. Also, the competition for the Police and Railway Jobs are very high. Every year many of the people are a missing chance because they are disqualifying in the preparation. To avoid that reason on the website we have given the Syllabus, Previous Papers and Exam Pattern for the convenience of people. Therefore, prepare well and grab a job in the RPF/ RPSF. Minimum 18 Years and Maximum 32 Years are eligible to apply for the Upcoming RPF/ RPSF Recruitment 2018-2019. In addition, to this, the age relaxation also applicable for all category candidates. Check the RPF Recruitment 2018-2019 Notification and refer complete data. Therefore, before applying, you have to satisfy with the Age. All the applied aspirants need to face Written Exam, Medical Test, Physical Test, Personal Interview and Document Verification. So, to get a place in the Railway Protection Force, all aspirants must and should clear all these rounds. Therefore, there is a tight competition for the Police and Railway Jobs. Don’t worry about the Salary Details because you can get an excellent pay from the Railway Protection Force. Moreover, along with Salary, you can also get the Grade Pay. Those who had completed their 10th/ 12th and Graduation are only eligible to apply for RPF Recruitment 2018-2019. At the above section, we have given detailed education qualification information. So, interested one can refer this post. There is a separate vacancy for Constable and Sub Inspector Vacancies. So, to get the complete information you have to wait until the availability of Official RPF Recruitment 2018-2019 Notification. To get the Application Fee, refer the Official RPF Recruitment 2018-2019 Advertisement. Therefore, visit our website Freshersnow on daily basis and get the new updates regarding RPF Recruitment 2018-2019.